Kera MacKenzie and Andrew Mausert-Mooney, Installation view, “Havoc and Tumbled,” 2015. 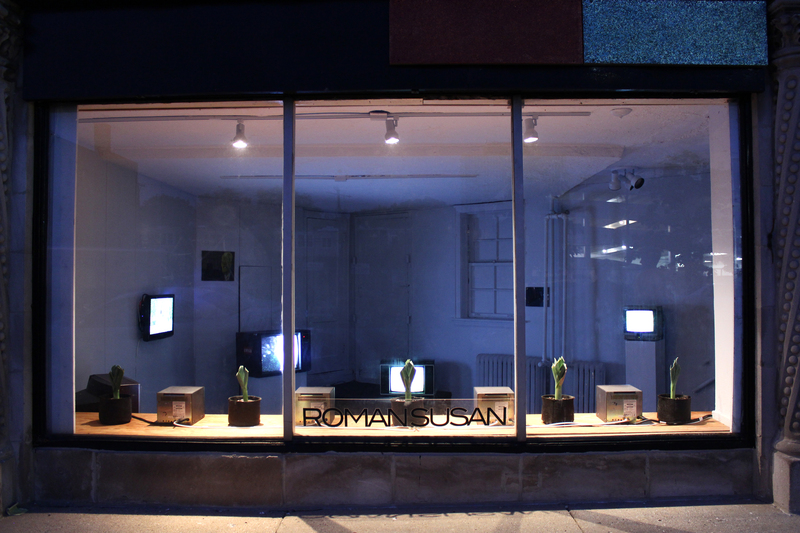 In “Havoc and Tumbled,” collaborators Kera MacKenzie and Andrew Mausert-Mooney packed Roman Susan’s little room with TVs and plants. 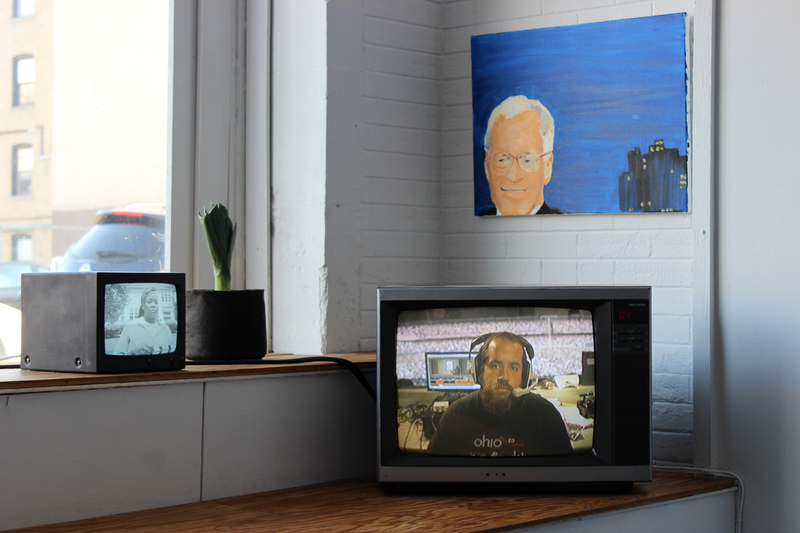 Each monitor is different, ranging from 1970s-style sets to slick, hi-def screens. While each video has its own content, bits of scenes and clips bleed into other TVs, establishing them as parts of the same filmic project. Each screen is different, so things shift in quality, creating a fluctuation in visual textures in this glimpse of wildlife in this Rogers Park gallery. The artists shot each piece, even when footage seems resolutely stock: a technician at a packed stadium, a controlled forest burn, graphic squirrel-butchering. The plants lining the storefront walls come from their porch, which we see in clips potted in the same black fabric. The show is as much about people in their lives—landlord, stepmother, student—than it is about a combination of wildlife, porches, outdoor activities and quick paintings of David Letterman. The familiar host is at turns benevolent and threatening against a cityscape, humorously suggesting that Letterman has joined the intimate plants and family on the artists’ porch as another friend among flora. Kera MacKenzie and Andrew Mausert-Mooney. Installation view, “Havoc and Tumbled,” 2015. One video documents the artists’ performance last May at Links Hall, part of the venue’s partnership with the nonprofit Acre, where their residency seeded this show. A performer canoes through wetlands, at turns pensive and frantic. Fortuitously, this video faces one the artists made on vacation, a brief recording of other tourists taking peeping-Tom peeks from Spanish battlements. Between the two videos, an interview details the phenomenology of the countdown: 3, 2, 1. Through July 25 at Roman Susan, 1224 West Loyola.